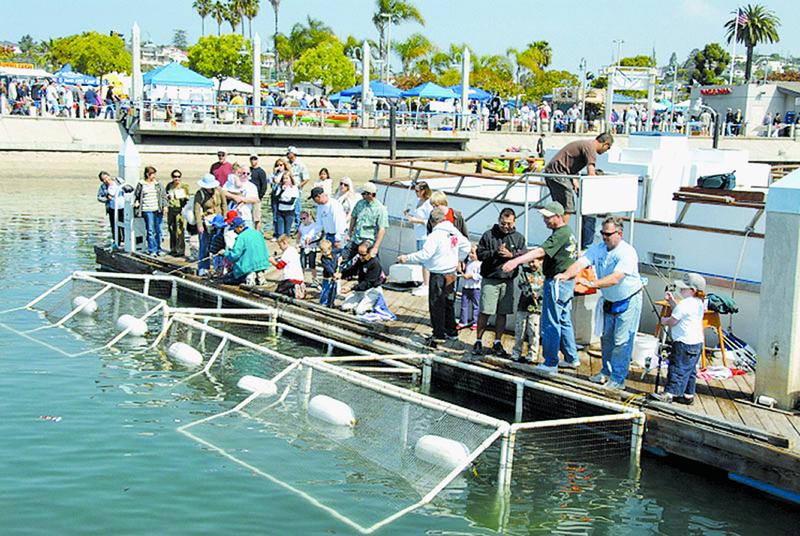 SAN DIEGO — The 33rd annual Day at the Docks at San Diego’s sportfishing landings in Point Loma is designed to offer fun for anglers of all ages, with deals, tackle, activities and seminars the whole family can enjoy. The goal of this free daylong event is to showcase what San Diego Bay and its fishing fleet has to offer in the way of sportfishing adventures. Running from 9 a.m. to 5 p.m. April 15, Day at the Docks will feature the latest fishing tackle presented by the industry’s leading manufacturers and historical displays showing how far saltwater tackle design has come. For anglers looking to gain an edge, how-to seminars will be given by fishing experts, revealing their secrets on how to improve both technique and results. Anglers can test their skills at casting contests held throughout the day, and sportfishing captains will showcase the numerous vessels in San Diego’s fleet — standing ready to discuss plans for the upcoming season. The whole family can enjoy boat rides on San Diego Bay, displays by marine artists, food, entertainment, kids’ fishing activities, contests, prizes and more. * 10 a.m.: Doc Lobanski “Doc Ski,” Master Rod Builder — Bringing the Family into the Sport. Where: West Marine Main Stage. * 10 a.m.: Ed Surek, Seeker Pro Staff and Cory Sanden, MC Swim Baits — In Bay Fishing with Artificials. Where: Berkley/Sevenstrand Weigh Station Stage. * 10:30 a.m.: Howard Hada and Norm Fujimoto, Izorline Pro Staff — Fishing Lines and Secure Knots. Where: Sunrise Bank Long Range Stage. * 11 a.m.: Capt. Chris Randel, M/V Indian from H&M Landing — Offshore Fishing for Tuna and Yellowtail. Where: West Marine Main Stage. * 11 a.m.: Jimmy Decker, Berkley Saltwater — Rigging Saltwater Gulp Baits for Inshore Fishing. Where: Berkley/Sevenstrand Weigh Station Stage. * 11:30 a.m.: Danny Kadota, Blackwater Tackle — Rods Should Wear Down the Fish, Not the Angler. Where: Sunrise Bank Long Range Stage. * Noon: Cesar Chang, Cal Star — Choosing the Right Rod. Where: Berkley/Sevenstrand Weigh Station Stage. * 12:30 p.m.: Lt. William Burwell, U.S. Coast Guard Helicopter Pilot — USCG Medevac from Sea. Where: Sunrise Bank Long Range Stage. * 1 p.m. Steve Carson, Rapala Pro Staff; Trolling with Rapala Jigs for Yellowtail and Tuna. Where: Berkley/Seven Strand Weigh Station Stage. * 1:30 p.m.: Jeff Gammon, Terrafin Sea Surface Temperature Charts — Using Satellite Temp Charts to Target Your Catch. Where: Sunrise Bank Long-Range Stage. * 1:45 p.m.: Capt. Mike Lackey and Angler Mike Livingston, M/V Vagabond, Point Loma Sportfishing — World Record Yellowfin Tuna: The Catch and the Record. Where: West Marine Main Stage. * 2 p.m.: Jimmy Decker, Berkley Pro Staff — Sportboat Fishing Techniques Aboard M/V Pegasus. Where: Fisherman’s Landing. * 2 p.m.: Jeff Solis, Solis on the Salt, FlyFishing Guide — Saltwater Fly Fishing. Where: Berkley/Seven Strand Weigh Station Stage. * 2:30 p.m.: Mark Mills, Shimano Pro Staff — Fishing the Lucanus Jig Technique. Where: Sunrise Bank Long-Range Stage. * 3 p.m.: Steve Carson, Rapala Pro Staff — Trolling with Rapala Jigs for Yellowtail and Tuna Aboard M/V Prowler. Where: Fisherman’s Landing. * 3 p.m.: Jim Davis, U.S. Coast Guard Auxiliary — The Latest in Marine Radios, Emergency Communications and GPS. Where: Berkley/Sevenstrand Weigh Station Stage. * All Day: Bill Roecker, Writer, Photographer, Saltwater Angler — “At The Rail,” a new book about long-range fishing. Where: Long-Range Expo. Scheduled from 9 a.m. to 4 p.m., Kids’ Fishing Adventure areas are set aside and stocked with fish, providing children with the chance to wet a line and make a catch. Expert assistance is provided by members of the San Diego Rod and Reel Club and the San Diego Anglers. The adventure is designed for children ages 4 to 12. This year, Day at the Docks is kicking off a larger month-long promotion to get kids fishing. During the month of May, the San Diego Bay-based sportfishing fleet will take kids fishing for free on any open party half-, three-quarter- or full-day fishing trip when accompanied by a paid adult. Throughout the day, Catch, Cook and Prep demos will provide ideas and techniques to for cooking, preparing and serving anglers’ catches. There will be presentations on proper handling, storage and preparation of fresh fish to ensure that every fish caught and kept is fully enjoyed. Recipes and samples will be available at the seminars. * 10:30-11:30 a.m.: Mitch Conniff, Mitch’s Seafood Restaurant — Filleting Yellowtail for Optimum Flavor and Yield. Where: Aboard M/V Islander, Fisherman’s Landing. *11 a.m.-noon: Shauna Barton, South Bay Lady Anglers — Shauna’s Famous Fish Tacos. Where: Aboard M/V Sea Adventure II, H&M Landing. * 11:30 a.m.-12:30 p.m.: Dan Hernandez, Sportfishing with Dan Hernandez — Smoked Fish Appetizers and Sauces. Where: Aboard M/V Indian, H&M Landing. * 1-2 p.m.: Mike Fitzgerald, Mesa College Culinary Arts — Shark Dishes. Where: Aboard M/V Sea Adventure 80, H&M Landing. * 1:30-2:30 p.m.: Robb Frans, Dining Details. Where: Aboard M/V Islander, Fisherman’s Landing. * 1:45-2:45 p.m.: Jean Neisewander, Outboard Boating Club — Canning Fish at Home. Where: Aboard M/V Indian, H&M Landing. * 2:30-3:30 p.m.: Rick Travino, Indigo Café — Seared Ahi with Mango Salsa. Where: Aboard M/V Islander, Fisherman’s Landing. * 3-4 p.m.: Chef Rick Trevino, Indigo Café; Seared Ahi with Mango Salsa. Where: Aboard M/V Searcher, Fisherman’s Landing. * 3:30-4:30 p.m.: Chad White, Owner/Chef EGO Culinary. Where: Aboard M/V Sea Adventure II, H&M Landing. Casting is a true test of an angler’s skill. If you have never cast a line in your life, don’t worry: This competition is for everyone, pro and novice alike. Competitions are set for 11 a.m. and 2 p.m. Points are awarded for distance and accuracy. Fishing trips and tackle will be awarded to the winners. Sponsored by Seeker Rods and Avet Reels. Young and old alike can try their hand at tying the strongest fishing knot with assistance from the pro staff at Izorline. Knot-tying demonstrations will be followed by hands-on competition, in which individual knots will be tested against the Izorline Knot Gauge, a device that measures a knot’s breaking point by pressure. Competition will take place in three divisions: Small fry (up to 10 years old), Juniors (11-16 years old) and Adults. A voluntary donation of $1-$5 to enter the competition will benefit the Rollo Fund program to take kids fishing. The contest runs all day from the Izorline exhibit booth. Winners in each division will be announced at the end of the day. Prizes include half- and full-day fishing trips. Look inside the Sportfishing Landings and in Tackle Central for continuous showings of dramatic sportfishing videos. Get a glimpse of the sportfishing adventures and action that are available on the San Diego fleet — from San Diego to Baja California, Clipperton Island and even Costa Rica. The whole family will want to take a boat ride around San Diego Bay, and it only costs $2. Trips run continuously throughout the day from the three sportfishing landings: H&M Landing, Fisherman’s Landing and Point Loma Sportfishing. For anglers looking for something to eat while enjoying Day at the Docks, there is great variety of cuisines to choose from — including seafood, Thai, Chinese, Mexican and more. Catalina Seafoods will be serving fish tacos, with proceeds are to benefit Monarch School. Many local restaurants around the harbor will also be serving Day at the Docks specials. Find out what’s hot on the fishing equipment market. The top manufacturers will be there to show off their latest and greatest gadgets. Some really new technology has hit the scene, and anglers will find great bargains on fishing tackle from exhibitor retailers and in the landing tackle shops. The modern sportfishers in San Diego’s fleet will host a grand open house, showcasing fishing vessels in all shapes and sizes. Anglers are welcome to step aboard and look around. Joining the fleet for the day will be a U.S. Coast Guard special purpose craft, the Harbor Police fireboat, Vessel Assist and Sea Tow towboats, some smaller fishing kayaks and trailerable boats. Glory Giffen will showcase her marine watercolors, and Peter J Galleries art will feature painting atop marine charts. On the Main Stage, things get going at 9 a.m. with live music — and the day will feature three raffles benefiting The Burn Institute. Raffles will be drawn at noon, 2:30 p.m. and 4:15 p.m. — all from the Main Stage. Prizes include fishing trips, tackle, tickets to area attractions and more. * 9 a.m. The Pound Dogs perform surf music that slides into the hard-driving beat of Latin-style rhythms, along with classic rock and roll. * 12:30 pm. : The Bayou Brothers perform with a sound straight out of Louisiana’s dance clubs, bayou festivals and backyard crawfish boils. * 3:15 p.m.: The Rhythm Ranchers, a quartet from Ocean Beach, performs American rock and roll — influenced by Johnny Cash, the Everly Bros., Buck Owens, Muddy Waters, Eddie Cochran and Chuck Berry.